Great Bay Beach Resort is conveniently located on the Dutch side of Sint Maarten near downtown Phillipsburg and the shops on the Boardwalk. Enjoy food and drink for one low all-inclusive fee per person per day. On site are threerestaurants and bars to enjoy along with a casino and non-motorized water sports, non-stop activity and a fitness center among other things. 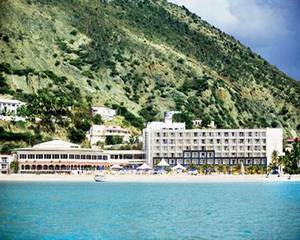 Located on a beautiful beach, Great Bay Beach Resort lets you enjoy all that Sint Maarten has to offer.